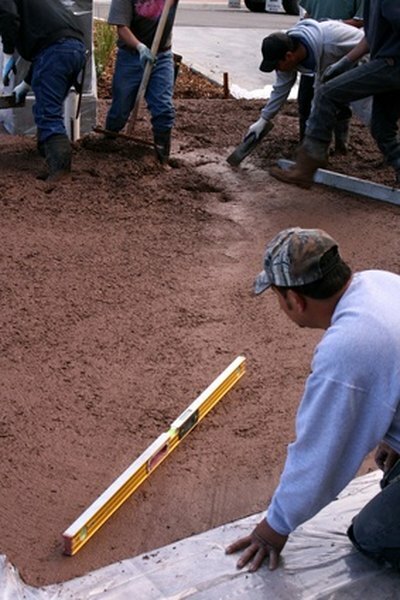 Save on both materials and labor when installing your concrete driveway. The art and science of concrete surfacing is millions of years old, according to Auburn University historians. The naturally occurring, spontaneous combustion of limestone and oil shale formed the first organic concrete compound in what is now Israel. These days, the only natural combustion you may encounter when approaching this project is the conflict between the cost of completing the job and your budget, so mix in some creative thinking before you start. Resurrect skills you learned over time to construct the concrete driveway on your own and save a bundle rather than hiring a company to do the job for you. Use your computer or a pad and paper to sketch the driveway, check with utility companies to identify utility lines on your property, obtain a permit and/or present the plan to your zoning board if either action is required. Pour your own driveway after grading the land and enjoy healthy savings. Save money on your driveway by substituting one raw concrete material for another, particularly if one type of concrete is fabricated exclusively for your geographic area and costs less to make. Asphalt is a less expensive paving product, but you can also purchase concrete mixes that are cheaper than the popular Portland cement. Compare prices for self-compacting, pump and sprayed concrete reinforced with fiber, or opt for mortar if that’s the least expensive driveway material in your area. According to Mother Earth News, some areas of the country are well suited to clay driveways and since the material is naturally occurring, you may not only save money but install an environmentally friendly driveway, too. A truckload of clay “could be spread out, tamped and rolled into a hard durable surface that would provide many years of service.” You can also substitute state-of-the-art driveway materials like Grasspave2, a system that gives a yard the appearance of being completely covered with grass, or Gravelpave2, a geotextile fabric injection molded material, if they prove less expensive than concrete to install. Crafting a concrete driveway requires more than materials. In fact, labor is often the most expensive line item in a construction budget. Bartering or trading goods and services remains a popular way to save money. Today’s barter and trade industry is more complex than yesteryear when doctors traded services for hogs and often relies on the Internet to make connections. To barter your concrete driveway, offer a skill or goods equal to the value of the job. The Internal Revenue Service recognizes bartering, requiring the completion of Form 1040, Schedule C and Form 1099-B at tax time. Internships, work-study and auxiliary programs associated with corporations can extend to trade schools and community colleges. Save money on your concrete driveway project while giving a student studying construction an opportunity to work on a job site. In lieu of hiring an expensive professional, a student can help you handle the labor while you learn about new methodologies from him. Arrange for an incentive -- a work-study agreement tied to a formal contract that gives the student credits in return for labor. This not only saves you money, but also helps the student complete his degree with an actual practicum under his work belt. How Concrete Works.com: Types of Concrete! Mother Earth News: Is There a Cheap Green Substance to Take the Place of Concrete for the Floor in a Garage?